In part 3 of 3 Dorf is at the North Pole in Santa’s workshop, he has to help Santa prepare for Christmas Eve and wrap all the presents coming down the line. 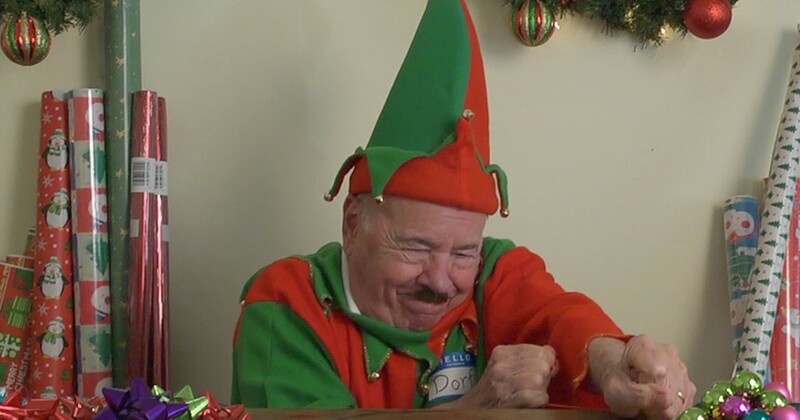 Dorf doesn’t have much experience wrapping presents as you can see. We hope he gets off the naughty list. Watch the third episode of Dorf’s adventure HERE. I Love you, Dorf. Keep up the good work. We will let our Santa Spotter know, thanks Barbara. Merry Christmas! Tim you are the funniest and this is the best from Dorf I’ve seen in a long time/ God bless everyone. God bless Paul, Merry Christmas! Cannot wait til Santa comes. I have been a really good boy all year…well most of it…ok some of it.. All right there are still 4 days to go I will be good. LOL we are sure you’ve been good Gus. Merry Christmas! My friend Gina who was only 47, died a week ago. Can you please leave somethimg extra good for her husband Mark? We are all loving and tryimg our best for him. I think your love and a hug would help too. Our prayers are with you and Gina’s family, Merry Christmas Dev.